Usain Bolt is a Jamaican sprinter. Bolt holds the Olympic and world records for the 100 metres at 9.69 seconds, the 200 metres at 19.30 seconds and, along with his teammates, the 4x100 metres relay at 37.10 seconds, all set at the 2008 Summer Olympics. Bolt became the first man to win all three events at a single Olympics since Carl Lewis in 1984, and the first man in history to set world records in all three at a single Olympics. 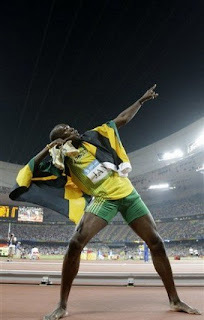 His name and achievements in sprinting have earned him the media nickname "'Lightning' Bolt".